There is nothing nicer than a hot beverage or a warm plate of food on a cold day at the bank, especially if you look like you’re heading towards a blank. This is why having top quality cooking equipment on the bank is absolutely vital, allowing you to heat through a kettle of water for a cup of tea or to cook up a full English breakfast. The Trakker Tri-Lite Stove allows you to do just that and it represents a new addition to the already impressive Armolife range. The first thing you’ll notice about the Trakker Armolife Tri-Lite Stove is its incredibly compact storage. In fact, this entire stove can fold into a minute 11.5cm x 5.5cm package, ensuring that you can pack it away into the smallest pockets of your carp fishing luggage. It even comes with its own dedicated nylon carry bag, to hold all the elements of the stove together. However, unfold the stove and you’ll be amazed by its size. This stove has an impressively wide frame, ensuring that it provides a stable base for even the largest of pots, pans, and kettles. The stove also has an impressively low centre of gravity thanks to these wide supporting legs, giving you the confidence to use the stove in high winds. 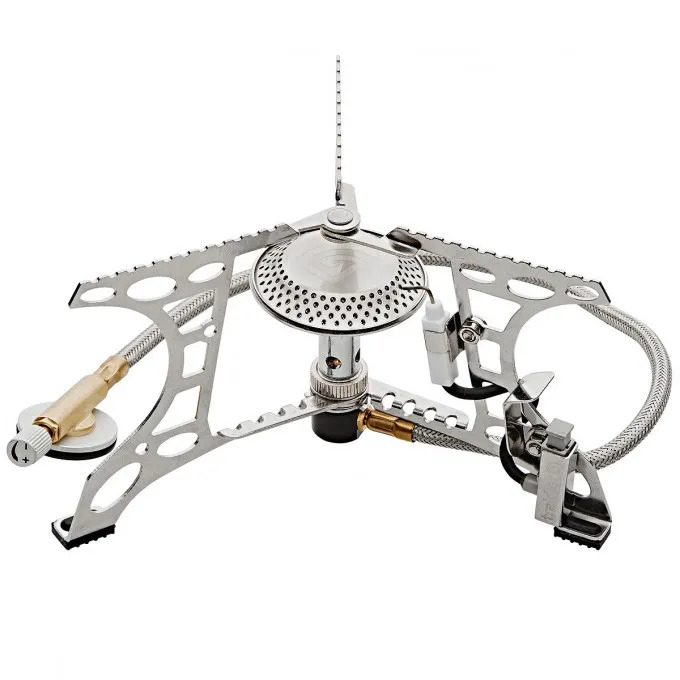 Once you’ve set your stove up, which is incredibly easy to do, the next thing you will notice is the incredible power to weight ratio that this stove offers. 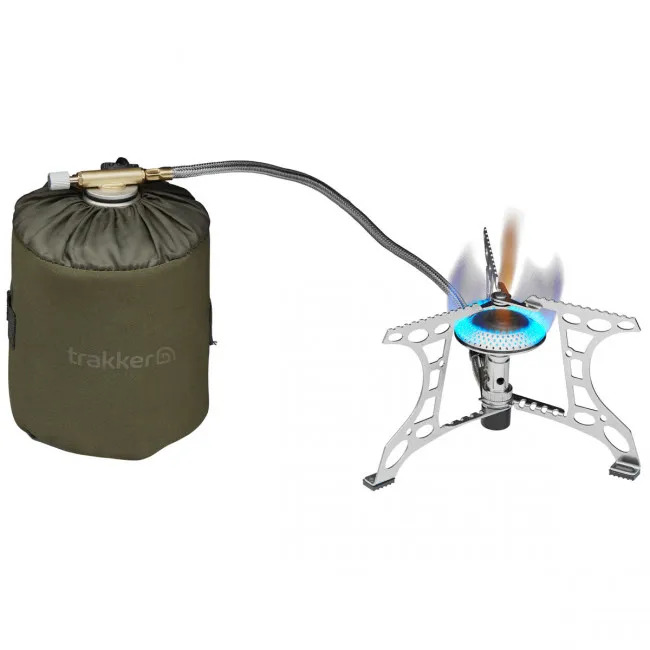 The Trakker Armolife Tri-Lite Stove is featherweight, at only 225g, ensuring that it won’t weigh down your tackle bag. However, it is able to kick out a whopping 3,200 watts of power! 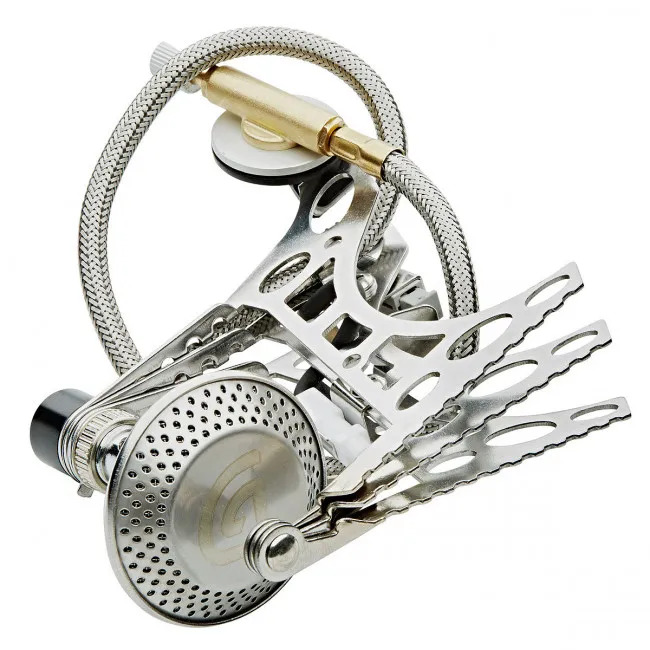 If you’re someone who is impatient, this kettle will suit you to a tee, as the high power of this stove will ensure that your kettle is boiled in no time at all. It also ensures that this stove is incredibly economical and it won’t burn through gas as quickly as you can buy it! Instead, you’ll be amazed about how long a gas canister can last when you’re fishing with the Trakker Armolife Tri-Lite Stove. Speaking of gas, Trakker is a company that listens to the talk on the bank. The brand quickly realised that anglers were disappointed with the length of the gas cables that were supplied with their stoves. This is why Trakker has designed this new Tri-Lite with longer length gas leads than ever before – ensuring that you can stand your gas canister a safe distance away from your stove. The stove itself is lit using a Piezo-electronic ignition system. This removes the need for matches on the bankside, making stove ignition safer, as well as ensuring that you can get your stove lit in all weather conditions. In fact, the Trakker Armolife Tri-Lite Stove boasts first time ignition, which ensures that you won’t be wasting time on the bank trying to get your stove lit. The entire stove is finished with gold coloured fixtures, as well as a gold Trakker logo in the centre of the hob. Whether you fancy a celebratory cup of tea after a successfully landed catch or you need hot food to fuel you on a bitterly cold winter morning, this Trakker Armolife Tri-Lite Stove will ensure that you can cook yourself up a treat on the bank. Trakker has been manufacturing top end tackle items since the 1980s, after the closure of Sheffield’s steel industry. The brand is most famous for its ultra-quality luggage solutions, although the brand also produces other quality bankside essentials, such as bedchairs, fish care products, and sleeping bags. Very good stove. Will boil a kettle in 1 minute on full power. Have not had chance to use it yet. Bought this for my son - said the stove was great. Great bit of kit, Folds down nice and neat. No messing, easy, quick, and clean. would recommend to anyone. My son has just replaced an old stove with this new one and has found this to be a much better quality stove with an instant ignition facility which his old one lacked. A brilliant piece of engineering.